I sincerely welcome you all – the life and vitality of our party – to our National Convention here in Batticaloa. As those in service to the Ilankai Thamil Arasu Katchi, which has become the political symbol of the Tamil Nation, with its own political culture and ideals, we are proud to gather here for its 14th National Convention in the year 2012. We are gathered here in hope and expectation, in circumstances never before experienced since Sri Lanka is said to have gained independence, 60 years ago. We are gathered here as the single most recognized political organization both here and abroad, which embodies the political aspirations of the Tamil people. We remember upto hundred thousand of our people who have been killed, merely for demanding the fundamental rights that belonged to them, and for the legitimate rights of self determination and governance. We remember the Tamil youth who sacrificed their lives in armed struggle, which they resorted to on the failure of their peaceful struggle for the political rights and freedoms of their people. We gather here following our victory in the passage of the recent Resolution at the UN Human Rights Council, a condemnation against the Sri Lankan government by the international community, which has recognized that the Sri Lankan government has committed the crime of extermination against our people, and that it continues to deny them their political rights. The Ilankai Thamil Arasu Katchi was created by S.J.V. Chelvanayagam, the father of Tamil Nation, for the purpose of establishing self determination of the Tamil people on this island. This objective is evident in both the name of the party and in the manner in which it operates. This objective is also based on the history of our people. The Tamil people do not only have distinct social and cultural norms, but, in times past, were even economically self sufficient. Upto 500 years ago, the Tamil people established their own governments, and governed themselves. Our party symbolizes a time in history, until the entire country was, for administrative convenience, ruled as one Nation by colonial powers, during which our people had their own sovereign Tamil governments. The symbol of our party chosen for us by our founder – the House – also symbolizes this. This House is the Home of our community; our community’s historical habitat; our community’s sovereignty. Our fundamental objective is to regain our community’s Home, its historical habitat and its sovereignty. The symbol of the House symbolizes this unshakeable aim. In the same way that, 6 decades ago, history saw the political origins of our party, 10 years ago history saw the emergence of a political vessel appropriate to the freedom struggle of our people during that time. This is the vessel that has assumed leadership of Tamil political parties that have, based on their common values, united under the umbrella of the Tamil National Alliance. This vessel of leadership has been shaped by our party’s unique history and tradition. It is the Ilankai Thamil Arasu Katchi that is the leader of this new Alliance, and that is how it will always be seen in the future. Following the end of the armed conflict today, it is those of us in the Tamil National Alliance, led by the Ilankai Thamil Arasu Katchi, who primarily represent the Tamil people. We are the single largest party elected by the Tamil people with certainty, courage, and strength, in an environment of absolute militarization, under the rule of the Sri Lankan government, in the midst of innumerable pressures. Thus, we are now the legitimate representatives of the Tamil people. Further, it is to the Ilankai Thamil Arasu Katchi, which does not have any history of armed struggle, which has always rejected such struggle, which has a longtime democratic tradition, which has always put forward realistic proposals, that the international community has given the most recognition. This recognition has now grown to include the Tamil National Alliance as well. The struggle for the political rights of the Tamil nation has now entered an entirely new chapter. It is our responsibility as leaders of the party, leading this struggle in this new era, to explain to you, our supporters, and to the Tamil people, who have elected us as their representatives, the policy of our party. The 30 years following Sri Lanka’s independence in 1958 were, for the Tamil people, filled with betrayal and humiliation. Agreements with the Tamil people and promises made to the Tamil people were broken. Constitutional amendments were brought in, rejecting the right of Tamil people to live as equals in Sri Lanka. The peaceful struggle of the Tamil people seeking justice was brutally quenched by armed violence. What clearly emerged during this time of degradation of the Tamil people was that the Tamil community lacked a source of power – both from within and outside it. Following this history of humiliation and betrayal, a position emerged that the only solution to this problem was the establishment of a separate government for the Tamil people. our party was a member, took the historical decision to establish the separate government of Tamil Eelam in 1976. Based on this decision of our party, and the need to place ourselves in a position of strength, Tamil youth decided to oppose violence with violence and began to rise up as armed rebel groups. Historically, it was the violence against the Tamil people that drove them to take up violence themselves. When peaceful struggle was consistently and brutally quenched by violent means, Tamil youth were forced to resort to violence. Frustrated by the inability to achieve anything by peaceful means, Tamil youth were driven to resort to armed struggle. One was the rapid growth of the Liberation Tigers of Tamil Eelam, which became a great force within the Tamil community. The other was the intervention of India, which, together with all its weaknesses, was a potential source of power from outside the Tamil community. The intervention of India was an inevitable chapter in the history of our political struggle. The intervention of India has clearly taught us the lesson that whatever our aspirations may be, India will never welcome a political solution in Sri Lanka that does not accord with the interests of India. However, using the intervention of India to our benefit, together with its assistance and blessing, we grasped an opportunity to arrive at a political solution that would enable us to live with dignity within a united Sri Lanka. Looking beyond our opinions concerning the matter, the intervention of India was historically inevitable. The political and diplomatic means of using this opportunity for either our benefit or our detriment lay in our hands. Despite the great force within our people, achieving Tamil Eelam was becoming an increasingly unrealistic goal. Thus, instead of sacrificing more lives to this cause, our party, with the help of India, began supporting a solution that allowed the Tamil people to live within a united Sri Lanka without compromising their fundamental rights. The struggle of our people for the past 60 years, by both peaceful and violent means, has taught us many lessons. It has brought us closer together as a community. The price we have paid for these lessons may be high, however, they will prove to be foundation stones for the next steps of our journey towards a bright political future for our community. A most important lesson we have learnt from the past 60 years – particularly from the past 30 years of violent conflict – is that we should act strategically, with the awareness that global powers will act based on their domestic interests. The rise and fall of the LTTE taught us that regardless of how strong such a movement may be, or how just its demands may be, it is not realistic for the Tamil people to resort to violent political struggle. Further, a struggle that runs counter to the values of the international community, built only on military might, will not prevail. It is for this reason, that in the new environment created by various global influences, we have, together with the support and assistance of the international community, found new ways of continuing with our struggle. There is no need for fear that the Ilankai Thamil Arasu Katchi has strayed from the objectives and aspirations of its forefathers, or that it will lead the Tamil National Alliance down the wrong path. With the destruction of their bargaining might, the Tamil people stood destitute, unable any longer to effectively engage in negotiations toward a political solution, and faced with a dark future. Today, the only hope it has is the interest and involvement of the international community in the reasonable demands on which our struggle is based. It is this that stands as a force for us, from outside our community, today. We must not forget the lesson history taught us, of the difference of opinion we had with India that not only caused it to distance itself from us for the past 20 years, but even caused it to work against us. We want to ensure that we do not act such a manner again, and thus alienate ourselves from the international community. The softening of our stance concerning certain issues, and the compromise we show in other issues, are diplomatic strategies to ensure that we do not alienate the international community. They are not indications that we have abandoned our fundamental objectives. Our expectation for a solution to the ethnic problem of the sovereignty of the Tamil people is based on a political structure outside that of a unitary government, in a united Sri Lanka in which Tamil people have all the powers of government needed to live with self respect and self sufficiency. We believe that only within such a structure of government can the Tamil people truly enjoy the right to internal self-determination that is their inalienable right. The position that the North and East of Sri Lanka are the areas of historical habitation of the Tamil speaking people cannot be compromised in this structure of government. We must have unrestricted authority to govern our own land, protect our own people, and develop our own economy, culture and tradition. Powers must be allocated under this structure based on the understanding that meaningful devolution should go beyond the 13th Amendment to the Constitution passed in 1987. This position has been accepted by our party. Our acceptance of this position does not mean that we consider the 13th Amendment to be an acceptable solution, nor that, in the event our right to internal self determination is continuously denied, we will not claim our right under international law to external self determination. It only means that this is the only realistic solution today. The above solution is also one that is likely to be acceptable to members of the international community including India and the United States, whose support and assistance is necessary in order for us to succeed in our struggle for political autonomy today. Further, since the thinking today is that whatever political solution that is arrived at must be one within a united Sri Lanka, the above solution is one that those in Sri Lanka cannot oppose as unreasonable. Any solution to the ethnic problem concerning the sovereignty of the Tamil people must also be acceptable to the Muslim community in Sri Lanka. The structure of government in Sri Lanka must also allow the Muslim community to fulfill their social, economic and political aspirations. The leaders of this country must wholeheartedly come forward to arrive at a solution that will enable the Tamil speaking peoples of Sri Lanka to achieve their civil, political, economic, social and cultural aspirations. This solution should constitutionally entrench the legal right of the Tamil speaking peoples of this country to take democratic decisions relating to their political aspirations. Now is the time to be patient. The world has recognized that the Tamil people have faced continuous political persecution, and that this persecution has begun to manifest itself in new ways in recent times. The world has recognized that great destruction took place during the final phase of the war. The international community that supported the government diplomatically and militarily during the war, has now begun to exert pressure on the Sri Lankan government to fulfill the promises it made to them. This includes the promise to arrive at a political solution acceptable to the Tamil people on the conclusion of the war. Exasperated by the failure of the Sri Lankan government to fulfill its promises three years after the conclusion of the war, the international community has begun to exert diplomatic pressure on the government. During this time, in which the international community is greatly involved in the ethnic problem involving the Tamil people, we must work in co-operation with them; we must consider their advice to us, and we must give advice to them. If we behave in a manner that results in the international community getting embroiled in problems or controversy it is our community that will face the consequences. Our priority now is to expose the Sri Lankan government that for so many years in the past attempted to describe the ethnic problem and a ‘terrorist problem’. We must clearly prove to the international community that the Sri Lankan government, which has delayed for so long in giving the Tamil people their rights, has never made any genuine effort to do so. In other words – we must prove to the international community that we will never be able to realize our rights within a united Sri Lanka. We must be patient until the international community realizes for itself that the effort we are involved in is doomed to fail. To put it more strongly, the international community must realize through its own experience, without us having to tell them, that the racist Sri Lankan government will never come forward and give political power to the Tamil people in a united Sri Lanka. Until then, we must be patient. The world does not revolve around the axis of justice. The freedom struggles of persecuted communities are not measured on the scales of justice. Global powers that preach of Democracy and Human Rights are themselves not the epitome of justice. We do not expect governments around the world and international organizations that support them to take pity on us, sacrifice their interests, and ensure that our rights are given to us. However, it is true that in recent times we have seen that the global community has not always been silent concerning serious human rights violations. Thus, if we can place ourselves at the point of convergence between the national interests and human rights convictions of members of the international community, our rights too may be protected. We must continue to preserve a suitable environment for this to take place. We must act with caution and be careful not to do anything to disturb conditions favourable to us or to put the international community into a difficult position concerning this issue. For this, we must be patient. The international practice prevalent during the mid eighties, when the intervention of India occurred, has now changed. Although the issue at hand is the same, the prevailing conditions are different. The struggle is the same, but the approaches we employ are different. Our aim is the same, but our strategies are different. The players are the same, but the alliances are different. That is the nature of the Tamil people. Although we still have the same aim, the methods we use are now different. In the past the United States and India stood against us. However in the favourable circumstances that have now come about, the United States and India are to a great extent supporting our position. The Sri Lankan government continues to maintain friendships with those standing against them. India’s vote in support of the Resolution presented by the United States at the UN Human Rights Council was a astonishing international development in our favour. This can only be seen as indication of future developments. Because of this, we must be patient. The strength of those of us in the Tamil National Alliance, led by the Ilankai Thamil Arasu Katchi, is that we have been democratically elected. Our people elected us as their representatives in elections that were conducted legally, in a fair manner. We are a great political organization, that has received an immense source of support – that of the people. It is for this reason that the international community too respects our political actions, and gives us the recognition that is our due. However, if the world begins to perceive us to be extremist, or too rigid, or if they believe that we have a hidden agenda to reignite violence, we will soon be ostracized from the diplomatic exercises in progress. We must show great care in our words and actions. And so – we must be patient. It is true that the 30 year long war greatly crippled the development of livelihoods in our community. It is also true that this war pushed our economic development back several decades. It is even true that the merciless war forced our people into a position where their daily existence has become a struggle. It is true that a duty lies with us all to rescue ourselves, our community and our people from this agony, to uplift them an acceptable standard of living. But, my dear friends, we must not for this reason fall into the trap of the so called development being brought about by the Sri Lankan government. It is a devious trap to undermine the very existence of the Tamil people as a community. It is a death trap. The Sri Lankan government is averse to our involvement in the rehabilitation of our people. It has not examined our proposals concerning our involvement in the reconstruction activities for our people. The Sri Lankan government has denied us our right to participate in schemes for the development of livelihoods of the very people we represent. 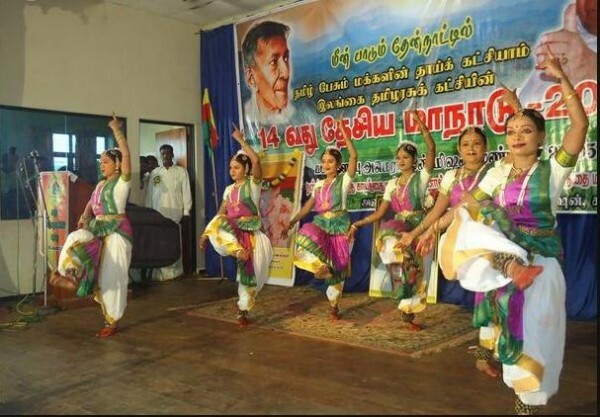 This government is attempting to change the demographic composition of the traditional Tamil homeland, as part of its deceitful scheme to undermine the existence of the Tamil Nation. It is for this reason that we must take care not to, in our eagerness and haste to rescue our people from their suffering, fall into this trap. We must act with wisdom and caution. However, an environment in which we may fulfill our duties is slowly coming into existence. The intervention of the international community and the pressure being exerted upon the Sri Lankan government will oblige the government to include us in the efforts being made to assist our people. Inevitably, the Sri Lankan government will eventually be forced to include our participation in schemes being implemented for the economic development of our people. However, until then, we must be patient. Our patience however, will not be everlasting. Our patience too, has its limits. Once we have reached that limit, we will move onto the stage of our effort. We will not hesitate to gather our people together and with the support of progressive forces in our country, and the international community, even engage in a non-violent struggle. We will decide on specific deadlines and when the time comes for such action, we will act. However, before we implement this plan of action, as we wholeheartedly attempt to arrive at a political solution, we must give adequate time to all the powers involved in the ethnic crisis to arrive at an acceptable solution. To allow this to take place, we must be patient. Being patient is in itself, a powerful diplomatic strategy. On behalf of those of us, the legitimate representative of the Tamil people, gathered here, I wish to clearly explain our position to the Sinhala people, the Rajapakse government, and the international community. Our political aspiration to acquire the rights due to us, and the right to govern our civil, political, economic, social and cultural affairs ourselves is a reasonable demand. It is a just aspiration; an aspiration that has its roots in history; it is even a fundamental right of our people. The solution we propose for the achievement of our political aspiration will not undermine the sovereignty of another people. It does not hide a devious agenda seeking to divide the country. It does not seek to damage the interests of another country. We appeal to you to understand the fundamental issue which is that just as you live in this country, in your traditional homeland, using the authority due to you, we too want to live in this country, in our traditional homeland with the authority due to us. You must thus reject policies that instigate ethnic division and hatred for the sake of personal political gain, understand and recognize the reasonable political aspirations of the Tamil people, embrace them as brothers, and come forth to live in harmony in a united Sri Lanka. However, the present Sri Lankan government does not have the political will to arrive at a concrete solution for the problems of the Tamil people. To the contrary, they are resorting to cunning plots to delay, avoid, and altogether abandon efforts to arrive at such a solution. The actions of the Rajapakse regime are all dishonest, immature and obtuse, and will only further entrench ethnic divisions. If this government continues to stubbornly cling onto this corrupt stance, it only means that it will result in degeneration the like of which this country has never seen before. I state clearly that unless this government makes the proper use of this final opportunity to arrive at a solution for the problems of the Tamil people, and wholeheartedly unites with us, this country will have to face one of the worst declines in its history. We have clearly asked for a solution within a united Sri Lanka, and we are committed to the achievement of such a goal. This solution must be reasonable, acceptable, realistic, and permanent. We are prepared to offer our cooperation and service to those committed to the achievement of such a solution. I think it is appropriate to deliver this message to the Sinhala people in this gathering, on behalf of all of us who are representatives of the Tamil people. Although we are deeply disappointed that the report of the Lessons Learnt and Reconciliation Commission appointed by the President places no emphasis on accountability relating to the manner in which the war was conducted, we feel that this report does contain some concrete recommendations. They are a guide to the achievement of true reconciliation and harmony. The Commission made several recommendations for the achievement of ethnic harmony, including specifically, the need to reduce military presence in civilian areas, to return to people the lands that belong to them, investigations into human rights violations, the release of those being kept in detention and most importantly, promptly arriving at a political solution that includes maximum devolution of power. We ask that the government implement these recommendations made by the Commission that it appointed itself. The government must, instead of always merely making promises, begin to act in a speedy and transparent manner. The 30 year war uprooted hundreds of thousands of people from their homes. While some of them left this country, today, 3 years after the war many thousands are still displaced, living as refugees in this country. The government should take immediate steps to resettle these people back in their homes. Speedy action must be of taken to resettle the people of Valikamam, Jaffna and Sampur, Trincomalee. The Sri Lankan government should accept and respect the fundamental right of people to live in their own homes, and act with responsibility in this regard. The international community should pay more attention to this issue, and facilitate processes for the government to better fulfill their responsibility in this regard. Many Tamil youth are in Sri Lankan prisons, with no hope for their future. While there are those who, three years after the war, have not been released and are still in detention, there are many who were captured and imprisoned after the war. These include those were captured by the military forces and those who surrendered themselves to the forces. Some have been charged, but as their cases have not yet been concluded they remain in detention for indefinite periods of time. There is no clear information regarding large numbers of those captured and those who surrendered themselves – secrecy surrounds their detention. The parents and families of these youth suffer great agony over their plight. The Tamil people themselves share in this agony. The treatment of these youth reopens old wounds, instead of attempting to heal them. We have repeatedly raised this issue with the government, but have received no concrete response. Not one promise that has been made to us in this regard has been fulfilled. The government must take speedy action with regard to this issue. It must reveal the truth regarding those arrested to their relatives; It must release detainees; it must understand that arriving at a concrete solution in this regard is essential for true reconciliation. We thus strongly urge the Sri Lankan government to act sincerely in this regard and take steps to release all Tamil political prisoners. I would also like to place frank emphasis on certain things that the global community must understand. Including all those killed during the war, upto those killed during the final battle in 2009, several tens of thousands of innocent Tamils have been killed as a result of the war. It is thought that the way in which the war was conducted, and other incidents relating to the war, violated both International Human Rights law and International Humanitarian law. It has now been accepted internationally that a transparent, independent and proper investigations must take place to determine the truth of the manner in which the war was conducted. The Panel of Experts appointed by the UN Secretary General also recommended such an investigation. Further, the Resolution passed at the recent UN Human Rights Council also emphasized on the government’s responsibility in this regard. Our position too, is that an inquiry should be conducted into the violations of International Human Rights law and International Humanitarian law during the war that is now over, in accordance with standards of International Human Rights law and International Humanitarian law. This is because we believe that an independent, transparent, legitimate investigation that is capable of determining the truth of what took place, which is acceptable to all parties involved and which holds the respective parties responsible, is indispensable not only for the Rule of law in this country, but also for peace, harmony and reconciliation. This is the final opportunity to bring lasting peace to this country. Countries that believe that lasting peace in Sri Lanka is in their local and international interests, must use this final opportunity that is now within their reach. History has taught us lessons through our non violent struggles for reasonable political demands that were all quenched by violence. The long history of violent suppression in 1956, 58, 61, 77, 81 and 83 made way for the war, which continued until 2009. Once again the Tamil people fear that as we again begin our non violent struggle for our political rights, an environment is being created for such struggle to be quelled by violent means. All the warning signs indicate that this is so. If such violence is used against us again, it will not only spell grave danger for the country, but will also result in great destruction for the Tamil people. It is thus the responsibility of the international community to prevent such violence being unleashed against the Tamil people. Our people may have suffered loss and destruction and become weary and jaded from the long armed struggle; but the world must clearly understand that events after the war only cause anger, rage, and frustration in our people. deliberate steps being taken to change the demographic composition of the Tamil homeland; removing ethnic, religious, historical and cultural symbols of the Tamil speaking peoples from areas traditionally inhabited by the Tamil people and constructing Buddhist temples and religious symbols in their place with the intention of destroying all traces of the Tamil people in those areas; none of these are signs of reconciliation. None of these are signs that the Tamil people are being treated as equals. None of these are signs that bring peace or hope to the Tamil people. These are all foundation stones for the destruction of the Tamil people, the like of which has never been seen before. Let the international community, which preaches the doctrine of humanity and the principles for the advancement of the human race, be aware that here, on this island, a national ethnic group that has lived here for several tens of thousands of years, is now on the cusp of extermination. The global community must understand that the future of a great people with their own distinct standards of humanity is now in great danger. We must all come together to change this. This is our last opportunity to do this. The international community must understand that. We must build up the Ilankai Thamil Arasu Katchi so that it may prove to be a strong source of leadership to Sri Lanka’s Tamils. Built up from the grassroots, it must become a great movement of the people. This people’s movement built from within the people, by the people, for the people, must not only be a great political force, but must also a positive impact on the social, cultural and economic life of the people. Our blueprint for the future of our party must thus be accurate and far sighted, able to facilitate the future development of the party in multiple ways. Our future plans must centre around women and youth, the pillars of the future and important members of our society. The 30 long years of conflict gave us no opportunity to build up our party in a proper manner. We must thus see the present environment, in which we have the great love and support of our people, and the assistance of the international community, as an important opportunity for the service of our people, and use it wisely. Women are the backbone of any society. A society will either stand straight and tall or bent and bowed depending on the manner in which the women in that society live. Historically, the Tamil woman has suffered indescribable pain and agony. Improving the social and economic lives of our women must be a foremost priority of our party. Youth are the pillars of a society. The future leaders of a community, they are an indication of the future of the community itself. Our party must also begin today the task of strengthening the pillars of tomorrow with lessons of confidence, good behavior and the indispensable importance of knowledge. The Tamil National Alliance provides strong leadership to all Tamils. When considering issues of development and deterioration of the Tamil people there can be no division of the Muslim, Hindu or Christian communities. In Sri Lanka’s new political environment in which the phrases ‘majority community’ and ‘minority community’ figure prominently, a most intelligent approach is for all Tamil speaking peoples to come together as ‘one people’. Thus, bringing together Tamil speaking peoples of the Hindu, Muslim and Christian communities to join in our journey to freedom must be a priority. Our service must also reach areas outside the traditional homelands of the Tamil people, to the hill country and the South. We must make appropriate plans for our work in those areas as well, and include the Tamil speaking peoples of those areas in our movement. The only way for minority ethnic groups in this country to preserve their ethnic, religious and cultural symbols and traditions is to join under the umbrella of Tamil speaking peoples. I would also like to use this opportunity to appeal to the political parties that are a part of the Sri Lankan government, representing some of Sri Lanka’s Tamil speaking peoples. The reason for the delay in arriving at a solution for the problems of the Tamil speaking peoples is the insincere, dishonest, harmful intention of the government. There may be personal and other reasons for parties representing some of Sri Lanka’s Tamil speaking peoples to offer their unconditional support to this government. However, these parties must not, in effect, assist this government in deliberately delaying arriving at a solution for the problem concerning the political rights of Tamil speaking peoples. These parties must not give the government an opportunity to fulfill its cunning plan to reduce the effectiveness of the solution that is arrived at, by claiming that it has the support of Tamil parties to arrive at a solution within a unitary state structure. These parties must come forward to act beyond personal and party interests and act in the in the interests of the people they represent. As representatives of the Tamil speaking peoples we must put forward a strong proposal for a solution that does not call into question the sovereignty of the peoples we represent. I ask all parties to unite together for this purpose. We are greatly indebted to the service of Tamil people who are abroad. Despite having left their motherland, they continue to serve it because of their great love for their country and their people, and their devotion to their community. As an ordinary Tamil living in this country, I greatly respect them. This gathering of those of us elected as representatives of our people is also an appropriate one to express our thoughts to our kin who are now abroad. Certain groups of Tamils living abroad, are of the opinion that the Tamil people in Sri Lanka have been completely defeated and are unable to expose the political situation here. This idea is not completely accurate. Quietly, but steadfastly, the Tamil people are talking about this situation. They are expressing themselves concerning the establishment of the inalienable political rights of our people. 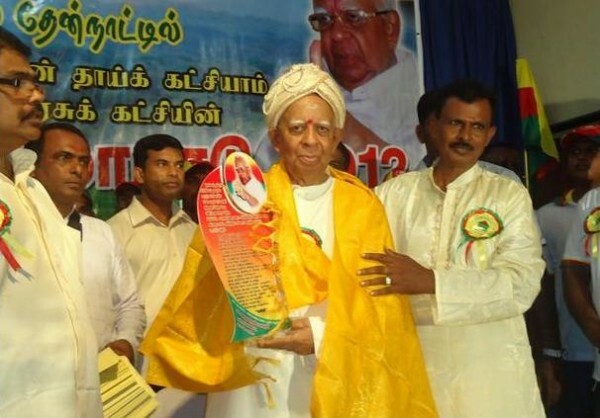 Their election of the Tamil National Alliance was in itself a strong and courageous message. In addition to the Tamil people, we, as representatives of the Tamil people, are also openly expressing ourselves. I thus humbly appeal to the Tamil Diaspora, that the thinking that the Tamil people in Sri Lanka have been completely defeated and are unable to express themselves concerning their political aspirations must decrease. Wherever our people may live – whether in the homeland, or abroad – those of us in the Tamil National Alliance will represent them all equally. However those who live abroad must think beyond their personal estimations and ideas, and always give importance to the situation of those living in the homeland. The Diaspora must respect the political thinking of those living here. They must respect the courage with which they make decisions, and their ability to determine their own political destiny. The Diaspora must trust in these capabilities of the Tamil people living here. The Diaspora’s political initiatives, and public statements on behalf of the Tamil people in Sri Lanka must not negatively affect the situation here; they must not prove to be obstacles to our efforts here. It is the efforts that are made by the people in Sri Lanka, which are made in accordance with the situation in Sri Lanka, and with sensitivity to this situation, that will finally bring about concrete results for the Tamil Nation. We must declare that it is the Tamil Diaspora all over the world that is a source of great political and economic strength to those living in Sri Lanka. Their presence, movements and participation must always be promoted and respected. During the brutal war, and in the immediate aftermath of its violent conclusion, it is the Diaspora that strengthened and supported the Tamil people here. It is our heartfelt wish that their service will continue with the same vigour and momentum. The Diaspora must be greatly involved in the improvement of the social and economic lives of the Tamil people in Sri Lanka. In this post war environment, they must work to increase their standard of living. It is the Diaspora that must create an environment that will be conducive to our people being able to stand on their own feet. This involvement must not be superficial but properly planned and implemented. It is our wish that the Diaspora create an economic structure distinctly suitable to our local environment for the benefit of our people here. Although we are here at a gathering of the Ilankai Thamil Arasu Katchi, as it is the Ilankai Thamil Arasu Katchi that gives leadership to the Tamil National Alliance, as the leader of both the Katchi and the Alliance I would also like to clarify the following matters. It is natural for differences of opinion to arise within a democratic political party. Indeed, such differences of opinion must arise, for that is the basis of democracy. However, such differences of opinion must be raised within the party and resolved there. They must not be expressed in public forums. This is not a good practice. Such practices will not promote unity or resolve conflicting ideas. In fact, they will only promote conflict and encourage it to grow. They will lead to schisms within the party and will not only impact the party negatively, but will weaken our community. As representatives of the people, we must never forget this. I would thus like to state with certainty and clarity that our party will not allow or encourage the modern political trend of publicizing internal conflicts that arise within the party. A defining characteristic of a democratic party is that it opens its doors to all kinds of opinions. Our party is such a party. As our aspirations are to improve the party and benefit the people, we welcome concrete ideas that will help in the journey towards that Sri Lanka. I would also like to state with certainty that we are determined in our desire to examine, select, internalize and implement constructive ideas and move on to the next stage of our journey. Our heartfelt desire continues to be that of creating a bright future for our people. We believe that the time is becoming ripe for this. Our understanding and relationship with members of the international community including India and the United States that has come about by slow degrees, little by little, as a result of methodical, measured action and thinking, is becoming a source of strength for our community. We believe that this has the potential to help us arrive at a concrete, permanent political solution for the ethnic problem our community faces. You are the fountain for this hope we have. What we need from you – is unity, trust, protection and co-operation. You must build the genuine unity that is necessary to create an untainted force that will lead the Tamil Nation. You must have faith that our every step is taken with great care along an honest and straightforward path with only one goal – to achieve lasting political freedom for our people. You must study with care the deep significance of our every effort, and not obstruct or discredit these efforts, but protect and promote them. Certain actions we take of a diplomatic nature, with deep political significance, must not be carelessly explained to our people, as this will only cause confusion and perplexity among them. Instead, you must give us your full cooperation. We remember all those who have lost their lives – more than a hundred thousand of our kin – in our struggle for freedom. It is with their blessings that we continue on this journey. We will do all we can to reach the Sri Lanka they were unable to reach in the past, using the approach of the past, with the contemporary approaches of today’s world. We will do this for them, and for ourselves. May this historical victory be our offering at the graves of those who have lost their lives, and may it make wholesome the withered lives of those who are alive today. « How do the Liberals respond to the global war on ‘terror’?